All agent routing rules settings are configured within the same settings page. This page can be accessed from the call wueues list page or from the settings page of a specific queue. Navigate to Numbers → Call Queues. Locate the Agents column in your list of existing queues. Click “edit agent routing rules” for the queue you wish to edit. Click Edit next to the queue you wish to edit. Click or scroll down to the Routing section of the settings page. Click the button labeled Edit Agent Routing Rules. Scheduled routing applies a schedule specific to this agent for this queue. Even if the queue is currently active and able to route calls to agents, the agent will only be dialed in this queue during the times defined by the schedule set here. Agents in multiple queues may have a different schedule for each queue they are in. To apply a schedule for an agent, click the drop-down menu under Scheduled Routing and select the schedule you wish to use. Click new schedule to create a schedule first if needed. Location-based routing will route calls to this agent only if the caller’s number matches a set list of area codes that you define. This option works well if you have multiple agents in the same queue, but each agent handles callers from different areas. To apply location-based routing, click Edit Locations in the Location-Based Routing section of the agent routing rules. On the next page, enter the list of area codes you wish to be routed to this agent (separated by commas). Click Save Locations. Limit-based routing sets specific limits on the number of calls this agent can receive from this queue. Limits can be set for a sliding window of time (so that the agent never receives more than three calls during any 24-hour period, for example) or for a set calendar day or month. You can customize which calls will count toward this limit by setting a required call length or a required reporting tag that must be applied to the call (such as “appointment booked”). To set a sliding window limit, use the fields and the drop-down menu to set the allowed number of calls per hour, day, week, or month. To set a limit based on calendar days, use the fields and the drop-down menu to set the allowed number of calls per calendar day or month. Weighting-based routing allows you to set a tiered order in which the agents will be dialed. Agents with higher weights will be rung first when multiple agents are available. For example, set the agents you wish to be dialed to first at a weight of 10, set the next agents to be dialed at a weight of 9, and so on. Agents with the same weight will be dialed simultaneously. Weights are ignored in round robin and “longest waiting” queue routing patterns. By default, the maximum simultaneous calls an agent can receive is set to unlimited. If needed, this setting can be changed to set a specific limit. Agents answering calls on the softphone can receive one call at a time. If the call is being routed to a receiving number, such as a cell phone or another phone system, then that system’s behavior will determine how concurrent calls are handled. Sending two concurrent calls to a cell phone will most likely result in one of those calls going to voicemail, for example. Max concurrent calls are set in the Weighting-Based Routing section of the agent routing rules. If you are using a smart router or a trigger to apply tags to live calls, you can assign tag-based routing so that certain agents will receive calls with certain tags. Tag-based routing can be set up for positive or negative matching (calls that do have the specified tags or calls that do not have the specified tags). To set tag-based routing, first click the toggle to enable the matching type or types you wish to use, then enter the applicable list of tags. The Connection Options section contains features that allow you to customize call recordings and agent prompts for individual agents. By default, call recording is set in the call settings configuration applied to the tracking number that is dialed. 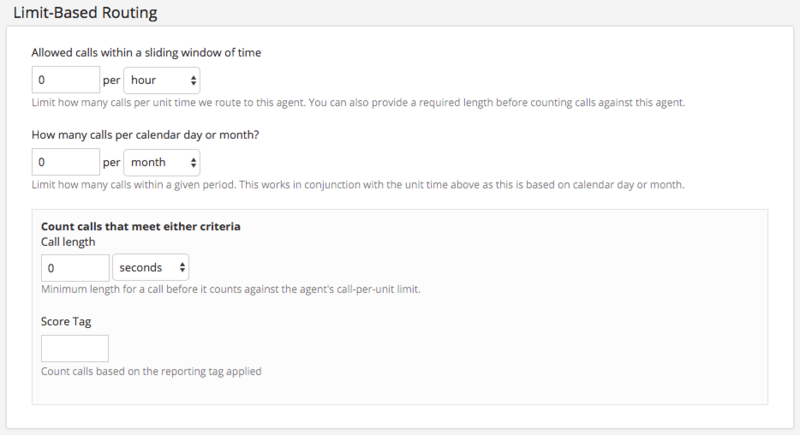 The call recordings feature in agent routing rules allows you to override those settings on a per-agent basis. 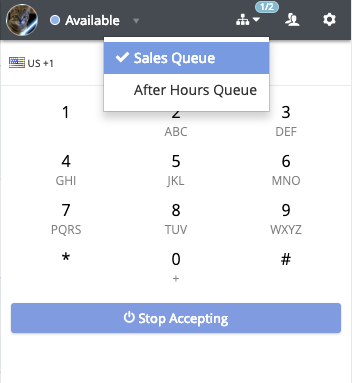 By default, prompting agents to enter a keypress to accept a call is controlled on the queue settings and applies to all agents in that queue. The “prompt agent to accept” feature in agent routing rules allows you to override that setting on a per-agent basis. By default, all device types are allowed. The “allow log out” toggle will enable this agent to toggle whether they are available for calls in this queue. Availability can only be toggled for this agent in queues that have this option enabled for them. When this option is enabled in at least one queue, a queues button will appear in the agent’s softphone window. Clicking this button will open a menu of queues that have this option enabled. A checkmark will appear next to the queues for which the agent is currently available to accept calls. The agent can click the name of the queue to set their availability at any time. Note: this list does not show all queues that the agent is assigned to; it will only list queues that have the “allow log out” toggle enabled for the agent. To update preferences for multiple agents at once, use the Edit All button found in the queue’s agent list. This in-line edit feature allows you to quickly update each agent’s weighting, schedule, sliding limits, calendar limits, the call length condition for limits, and max concurrent calls. From the agent list page, click Edit All. Several fields in the list view will now become editable. Type in the blank fields or use drop-down menus as needed to update any agents whose settings need to be changed. The list page will update to reflect your changes. Review all changes and continue to edit as needed.